A pretty rose garden it is not, but this little Chinese eatery in Elizabeth Street is one of the tastiest and best value ‘cheap eats’ restaurants in Melbourne. I’d never heard of the place but every time I passed by on my bike I noticed it was packed to the brim, so one day I decided to try it. I’ve been hooked ever since. The food is basic street-hawker style, and almost everyone here orders something from the ‘Rose Garden Top 10’ menu. 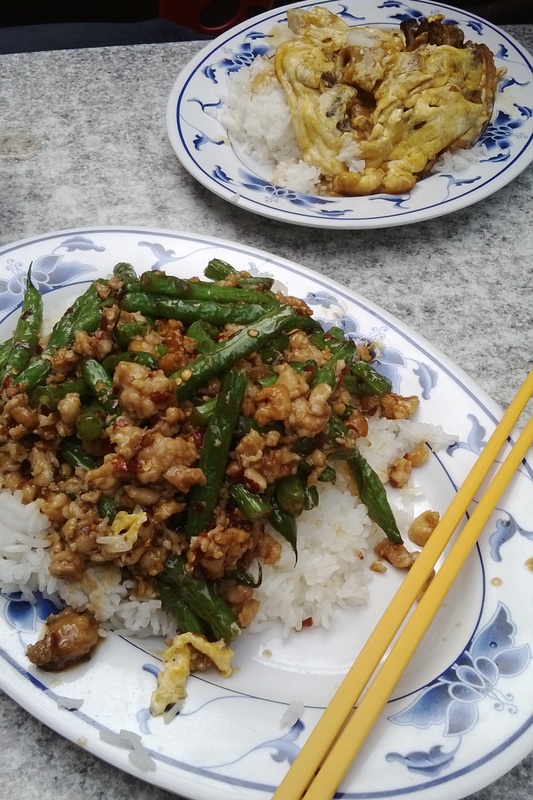 My favourite is No 1 — spicy green beans with minced chicken on rice (pictured above along with the crispy skin pork omelette). The servings are enormous — I rarely get through a whole plate — and it’s dirt cheap at only $9.50 or $10. The service is lighting fast and you’ll be eating your meal within five minutes of ordering. The restaurant is usually very busy, with tables spilling out onto the footpath, but you’ll never wait long for a table. This isn’t the place for a romantic date, but as a delicious pit-stop it’s hard to beat.